The Treasury yield curve is typically upward sloping where long-term yields are higher than short-term yields. The longer the time to maturity, the higher the risk to the bondholder since the longer-term bonds have a longer time horizon and are therefore exposed to more potential changes in interest rates than short-term bonds. This forces investors in long term bonds to seek higher yields in exchange for accepting the added risk of a longer maturity bond. What is the Treasury yield curve? The U.S. Treasury Yield Curve compares the yields of short-term Treasury bills (those with terms of less than a year) with long-term Treasure notes and bonds (notes have terms of two, three, five, and 10 years while bonds have terms of 20 or 30 years). Yields always move in the opposite direction of Treasury bond prices because low demand drives the price below the face value while high demand drives the price above face value. A yield curve might become inverted if investors are worried about the strength of the economy in the future. If an investor is willing to accept a lower interest rate in the future it is likely because they expect economic growth to be weak (or negative) in the future and that the central bank will reduce interest rates in the future to try to spur economic growth. There is typically some nervousness among investors when the yield curve is flattening and could be heading toward inverting. What Should Long-Term Investors Do About an Inverted Yield Curve? For a long-term investor who would otherwise remain invested, taking an inverted yield curve as a signal to sell can be detrimental. While an inverted yield curve is a potential predictor of a future recession, the future recession could be months or even years away. Timing the market is extremely difficult and you run the risk of selling too early and missing out on positive performance from being out of the market. As JP Morgan points out in the chart below, missing out on the 10 best days of the market in a given year could reduce your total return for the year by more than half. By extension, missing out on the 20, 30, or even 60 best days continues to negatively impact your returns, eventually even eating away the initial investment by more than 6%. It’s important to note that an inverted yield curve isn’t viewed as a cause of a recession, just as a potential warning sign of a recession. In addition to the fact that the yield curve hasn’t actually inverted yet, there are currently few warning signs of an imminent recession. Again, the U.S. yield curve has been flattening but hasn’t yet inverted. Even if the yield curve does invert, there is no guarantee that a recession will follow in the next month, the next year, or the next five years. 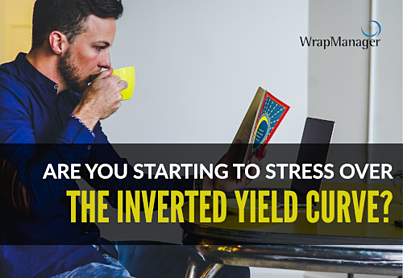 The best course of action for long-term investors is to understand what an inverted yield curve means and look to their long-term investment plan for the best course of action. If you are concerned about how your portfolio would fare in a recession however, our wealth managers are more than capable of helping you evaluate the amount of risk in your existing investments. To begin the process of reviewing your existing investment portfolio, please request your detailed investment plan now.